Mini adjustable scoop/cup that measures liquid and dry ingredients. 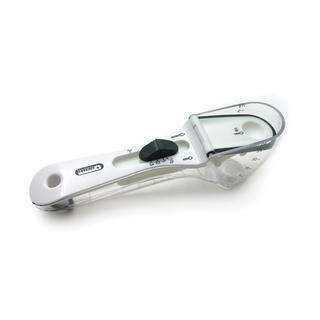 Patented mechanism - one hand adjustability - slide rubber thumb-knob to various positions for measures - 1/4 to 1 oz. ; 5ml to 30ml; 1 & 2 Tbsp; 1/2 to 3 Tsp; 1/8 Tsp measure on lid. Virtually unbreakable and stain resistant. Space-saving: replaces measuring cups & spoons. Comes apart for easy cleaning. Dishwasher safe. Magnet on back – for easy attachment to fridge. Translucent PC plastic. European designed.